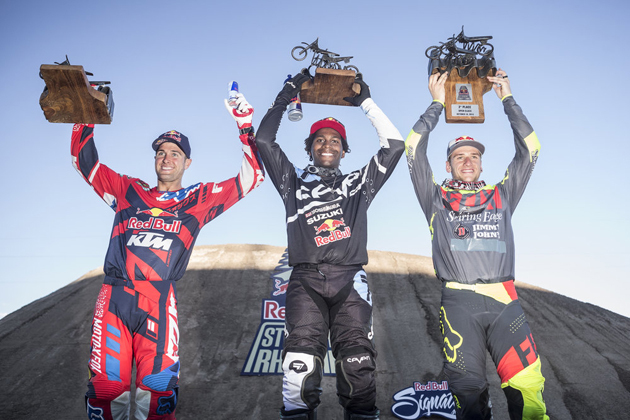 How Supercross king James "Bubba" Stewart Jr. roared back into action with a big win at Red Bull Straight Rhythm 2015. Before James "Bubba" Stewart Jr. approached the starting gate for his semifinal race at the inaugural Red Bull Straight Rhythm last October, Rene Zapata, Stewart’s mechanic, offered a final piece of advice. At a typical Supercross race, Stewart would have to worry about other opponents besides Malcolm Stewart, his younger brother. 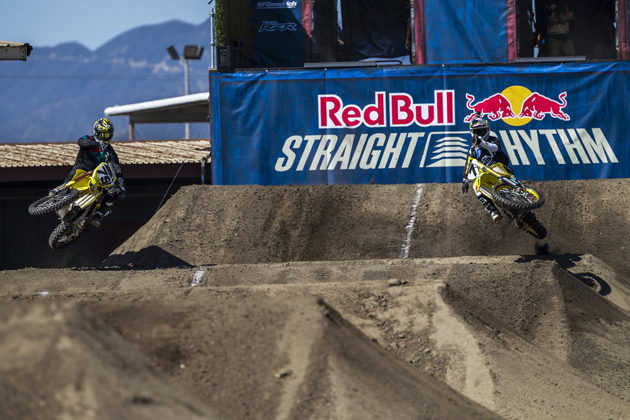 But the Red Bull Straight Rhythm is not a typical race. The event features head-to-head racing on a half-mile straight rhythm section that consists of 80 jumps of various heights and distances. There are no turns. Compared to a Supercross main event race with its 20 laps, Straight Rhythm is a sprint. ​Jeremy Mallot, the motorsports manager for Red Bull, first proposed the idea of the “unwound” track to some of the team riders in late 2012. Dungey was on hand to test the prototype course that Red Bull built outside of San Diego in November 2013. So were the Stewart brothers. Although the day was intended as an exhibition, impromptu races quickly ensued, like the one between Dungey and Marvin Musquin. The positive feedback generated by the proof of concept prompted Red Bull to hold the inaugural event in October 2014 at the Fairplex in Pomona, Calif. The track was built on the Auto Club Raceway—usually the site for NHRA drag races—and 32 of the top Supercross and Motocross riders competed in a best-of-three, bracket-style tournament to crown the Open class and 250cc class champions. James and Malcolm produced two of the most exciting races when they squared off in the semifinals. The Stewarts grew up in Haines City, Fla., and trained at the practice track that their father, James Stewart Sr., built in the family’s backyard. Malcolm, who is seven years younger than James, has often been overshadowed by his older brother’s success. An 11-time amateur champion and three-time World Supercross Champion, James Stewart, 29, has been called at “the best rider on Earth,” and “the Tiger Woods of Supercross.” Even JS7, the iconic combination of Stewart’s initials and racing number, shares a striking similarity with soccer superstar Cristiano Ronaldo’s nickname, CR7. During their second semifinal race, it looked as though Malcolm would earn bragging rights—if only for the day. He was ahead by a comfortable margin at the midway point, but then undershot a jump. James pulled in front. He didn’t look back. He finished in 48.59 seconds. The spectators who filled the grandstands at the Fariplex’s horseracing track, the site for this year’s Straight Rhythm, could understand James Stewart’s relief. Throughout the entire afternoon in the 95-degree heat, it was Malcolm Stewart who was the most dominant rider. After receiving a factory sponsorship earlier this year, he raced in the Lites Class (250cc motorbikes) for Geico Honda. He won every race and took the Lites title. More uncertainty surrounded whether James Stewart could defend his Open class title. In December 2014, the Fédération Internationale de Motocyclisme (FIM) levied a 16-month suspension against Stewart after he tested positive for an amphetamine during a drug test on April 12 at the Seattle Supercross event. Stewart had a prescription for Adderall, but did not fill out a required Therapeutic Use Exemption form. He appealed the decision. The decision was upheld. ​Since the suspension was enforced retroactively from the date of the failed test, it ended on August 11. Straight Rhythm was Stewart’s first race back. During Stewart’s absence, Ryan Dungey grabbed the headlines and his own share of titles. for Male Action Sports Athlete of the Year, the first motocross rider to earn that distinction. Dungey credits the turnaround from a disappointing 2014 season to his new 450cc motorbike from Red Bull KTM and to a training regimen developed by Aldon Baker. Baker places heavy emphasis on cardio and Dungey cycles at least an hour a day, often more than two hours a day in the off-season. Baker also has his athletes wear heart rate monitors both during workouts and on race days to quantify their efforts and to help make individual adjustments to their programs. ​Stewart and Dungey met in the semifinals after both riders breezed through their Round of 16 and quarterfinal matchups. Dungey won the first semifinal race in a late come-from-behind effort and handed Stewart his first loss at Straight Rhythm. Stewart wasn’t deterred. He won the second race and set up the first three-race match of the event. In the final race, the two were side-by-side for over half of the track, but then Stewart inched ahead after he cleared the entire "Dragon's back," jump. He won by a nose. Stewart didn’t let the final go to a third race. He swept Ken Roczen, who earned the No. 1 seed after he posted the fastest times in qualifying. The clinching race looked like a victory lap for Stewart. After throwing a Tiger-esque fist pump in the air over the final jump, James then hugged his brother to celebrate the Stewart sweep. “We made history today,” Malcolm said. While James Stewart has been more accustomed to winning, he seemed even more excited than his brother. He finally got the opportunity to prove the hiatus hasn’t slowed him down. “You don’t understand how good it feels to be back,” he said.